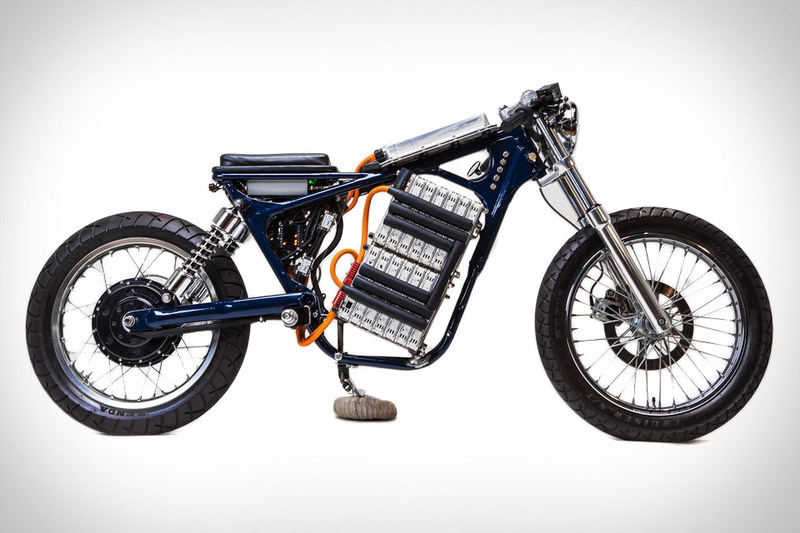 Built from the ground up using combustion bikes as a base, Night Shift Electric Motorcycles are both stylish and practical. The company's done two builds so far, the first being Rebel, a modified 1987 Honda Rebel 250 powered by the guts of a golf cart drivetrain. Their second build, the Leafy Savage, is far more advanced. Its battery pack was taken from a Nissan Leaf, and a 2003 Suzuki Savage was used for the frame (hence the name), with an Enertrac motor providing a maximum output of 40 hp. Produced in Germany from 1921 to 1925, the Megola Motorcycle only saw around 2,000 bikes completed. That's why this 1921 Megola 640CC Touring Motorcycle model is such a rare find. It's powered by an original 640cc five-cylinder radial engine that is built into the front wheel and is started by pushing or rotating the wheel with the machine on its stand. The model was built four years ago and arrives at auction for collectors with a rich sense of moto history as well as an appreciation for its incredibly unique features and starting technique. Named after the design team's booze intake during its creation, the Icon 1000 Three Martini Lunch Motorcycle is a low-slung take on the Triumph Thruxton. Painted Verdoro Green, a color stolen from the Pontiac GTO, the bike mixes KZ1000 wheels and Harley forks with the Triumph frame, an integration made possible with the help of a Nitron suspension, brakes from EBC, and Avon tyres. The result is a unique, sporting bike that demands attention, from its distinct color to the "X" pattern over the headlight. For their first build, Pan Speed Shop turns a BMW K1200S into a dystopian dream ride. Stripped to the frame, the Pan Meka Motorcycle replaces its original plastic body with handmade raw steel forms and a custom-designed exhaust. The bike was totally rewired for an upgraded digital dash and push button controls. While all the lights were handcrafted, the front, made from double Xenon day lights that open and close automatically, totally separates the bike from its former self. Named after racer Giacomo Agostini, who won 13 Grand Prix championships and 10 Isle Of Man TT's, the Deus Ex Machina Ago TT Motorcycle is part tribute, part modern reinvention. Based on an MV Agusta Brutal 800rr, the bike sits on a custom subframe, and offers several dramatic features, among them the custom aluminum tank shell formed from seven separate pieces of aluminum. There's also a handmade aluminum tail that houses the electronics, a custom Öhlins rear shock, Beringer hand controls, and a Scitsu tach. Also notable is what it's lacking, namely a headlight, turn signals, and license plate, as they're unnecessary for a bike whose only home is the track. Triumph held the motorcycle land speed record for nearly 15 years straight, but that run ended in 1970. The Triumph Rocket was built to bring it back after a 45 year absence. Powered by a pair of turbocharged Rocket II engines producing over 1,000hp combined, this carbon Kevlar-skinned land missile is over 25 feet long, yet just two feet wide and three feet tall. It'll be piloted by Guy Martin, a famous British motorcycle racer and one of the few crazy enough to compete in the Isle of Man TT. Aiming for a speed of over 400 mph, they'll take their shot later this month. You don't need us to tell you how much fun it is to go off-road in an ATV. But the Tarus 2x2 Motorcycle raises the off-road stakes even higher. This ATV disguised as a motorcycle is capable of slicing through rough terrain like mud, swamps, snow, and mountains. It can also navigate where four wheel ATVs cannot due to its compact, light-weight size. Weighing less than 200 pounds, it's collapsible and can be broken down in less than five minutes and stored in the trunk of a car.